An interesting and different kind of pie. 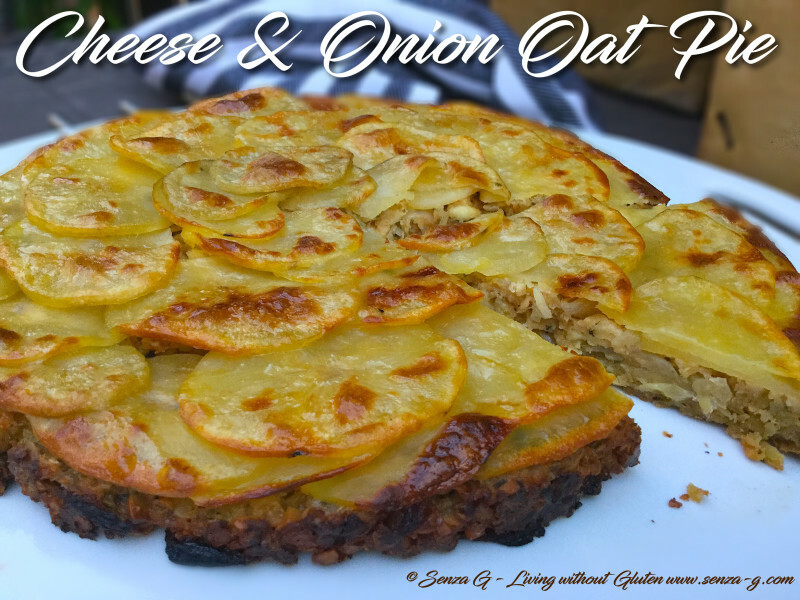 Filling is mostly made with oats and crushed hazelnuts which is then combined with eggs, onions and cheddar cheese. This is topped (which actually is the bottom as you will see) with scalloped potatoes, grilled to a lovely golden brown. Saute the onion and garlic in some olive oil and butter over low heat until translucent. Sprinkle a teaspoon of sugar and continue cooking until caramalised. Set aside to cool. Spread the oats on a baking sheet and toast in the oven for about a quarter of an hour, adding the coarsely ground hazelnuts 5 minutes before the end of cooking time. Leave to cool. Add the onions and garlic to the oats and hazelnuts, together with the eggs, the grated cheese and the parsley. Season with salt and freshly ground pepper, adding the sauces too. Combine everything well. Grease and line a quiche dish with baking paper. Place the potato slices in a concertina fashion on the bottom of the dish. Pour the oat filling on top and level with a tablespoon. Cover the dish with aluminium foil place in the oven and cook for about 30 to 40 minutes. Take out the dish, leave to cool enough to handle and remove the foil. Place a large serving dish on top and invert the pie onto the serving dish. Gently remove the baking paper. Brush the top of the potatoes with olive oil and place back in the oven and grill until the potatoes are golden, nice and crunchy. Slice into wedges and serve with salad if desired.